Although Sprint customers just recently managed to get comfy with the Google Nexus 4G, it seems that we’re beginning to see the first tide of worthwhile news regarding a true successor to the Nexus line of Android powered smartphones. With the summer season just about at full swing by now this weekend, something juicy managed to come around to show off its face. Alleged to be the next Google Nexus branded smartphone, we’re getting a first glimpse of the device in its early stage – and it’s probably just a prototype unit at this point. Still, you can visibly notice that the front is completely clean looking with no sight of any physical or capacitive buttons that we tend to associate with Android handsets. Apparently, a Google employee who works in the Android development team states that HTC and LG are in the running to produce the Nexus 3. Whichever way they decide to go, it appears that the handset won’t see the light of day until the crucial holiday time frame in December – with Android Ice Cream Sandwich in tow obviously. Taking into account that Google has been partnering with Sprint with a lot of their new services, one could only imagine the next iteration of the device landing with the number three carrier in the US. However, it’s also rumored that another one is being developed for T-Mobile so that the two can be released at the same time. An LCD screen? Isn't amoled the champion of Android? Both previous nexus units had one version or another of an amoled screen. Furthermore id doubt the quality of the screen. The best LCD displays such as qHd and the retina display are almost black when the powers off. Almost as black as an amoled display. Wait and see I guess. Please have buttons, please have buttons, PLEASE HAVE BUTTONS! of course it will have buttons, software buttons, just like honeycomb! there's not too much difference between capacitive buttons and software ones. u know u said two different screen types right? haa and does this not look like a vibrant? qHD is a screen resolution. SAmoled+ is a screen type. 2 different things. It reminds me of an HD7, but with the screen going edge to edge. That looks like a regular LCD screen on the thing, but this is a prototype model... if its anything. Button free says something of the new features of "ice cream sandwich". Besides, capacitive buttons are more or less just dedicated screen space to buttons. What if you could change them to whatever u want, but they were still in the same static space? that would be cool. fat chance...google seems to mandate a distinct lack of bloatware on the Nexus devices, and Verizon seems to mandate a distinct excess of bloatware on damn near everything it sells. There are a few exceptions but still, I won't hold my breath. If only Verizon joined the open handset alliance we would get one, but you know how Verizon is with their damned bloatware and that dreaded Bing. I don't kno what they have in store, but it sounds good!! 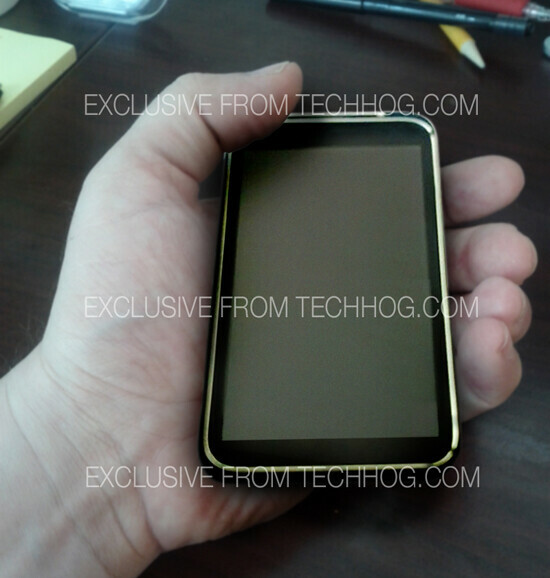 is it me, or does that phone kinda look like an iphone 3G/S with that chrome outlining? it's just you. It looks like the HTC Windows Phones. No its not just you. 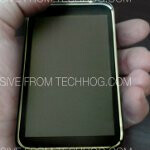 It highly resembles a 3g or 3gs with the crime bezel and rounded corners. Looks bigger though. Looks like an interesting device, but there better be at least one physical button on it, and I have to say that I don't really like the Amoled screens as they tend to have photos darker than normal. My gf has a Vibrant and I a Droid X and when she sends me photos they are on the darker side, while on her phone they look fine. Give me one of those newer LCD's that run low power and has qHD resolution or higher, well the X screen is pretty good. I wonder if Google might launch a Nexus on Verizon's LTE network...? If the Nexus 3 has a LCD screen instead of a AMOLED, in my opinion, that's taking a step backwards. the next phone has to have super amoled plus or else forget it. going w/htc or LG is a step backwards. neither companies have nice screens. Looks like a buttonless iPhone 3GS, funny to know that Samsung produced it.